The people of Rose Creek, frightened under the control of the industrial Bartholomew Bogue, decide to hire seven outlaws to end the threat: Sam Chisolm (Denzel Washington), Josh Faraday (Chris Pratt), Goodnight Robicheaux (Ethan Hawke), Jack Home ( Vincent D’Onofrio), Billy Rocks (Lee Byung-hun), Vasquez (Manuel García Rulfo) and Red Harvest (Martin Sensmeier). However, soon they will realize these seven who are fighting for something more than just money. 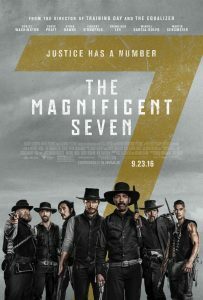 Remake of the western “The Magnificent Seven ‘(The Magnificent Seven) John Sturges, in turn remake of” The Seven Samurai “by Akira Kurosawa.